A stage-ready, tonally adept instrument that will provide the goods reliably for years. An honest 21st-century dread with bags of tonal colour. Once again, traditionalists may whinge a bit about the drop in low-end oomph. 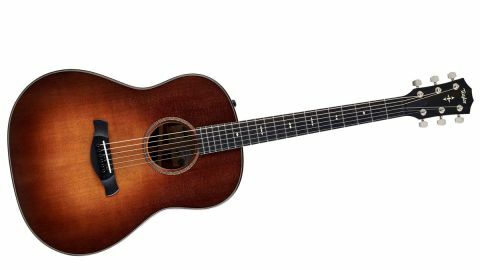 The 517 features mahogany back and sides along with a mahogany neck, all of which is toned in to match the deep brown of the top. As ever, the fingerboard and bridge is a deep dark ebony but the inlay is minimal; binding is of the same colour with subtle purfling and minimal soundhole decoration. It appears the intention is not to offer a cutaway, either. Picking up the 517e, the first thing you notice is the satin finish, which feels smooth and has a very old-world quality to it. We put the ‘silent satin’ through its paces and, sure enough, it didn’t squeak once! The neck feels comfortable, the advances here - the transition from V to C - are subtle and certainly don’t throw anything unexpected under the wheels of your playing style. Just like most compound radius fingerboards we’ve tried in the past, if you didn’t actually know they were there, you wouldn’t immediately detect any change of feel while casually polishing up your ditty repertoire. Once informed, you might conclude that Taylor’s Compound Carve is aiding your transit from low positions to high, but many, we suspect, will be content to remain in blissful ignorance, so subtle is its effect. The 517e is well balanced on the lap when playing in a sitting position. The lack of a second heel-mounted strap peg prevents us from commenting on how the guitar would fare when standing, but there’s nothing here that would lead us to suspect you’d experience anything untoward. As to its voice, maybe it’s that change of bracing, but that ripe ol’ dreadnought thickness in the midrange has all but disappeared. Let’s not forget, though, that this is a modern dread, with a contemporary pickup system and not something that relies on an enhanced lower middle response to be heard via a microphone in live performance, as was once the case. Then it was down to the more boom the better, but today we live in a more technologically enlightened world. Instead, here we are treated to a smooth equality across the frequency range, and while it might not be the loudest dread we’ve encountered, it certainly has charm.